Everyone knows that the LS platform flat-out performs. Junkyard LS engines are widely available thanks to their widespread use, as pretty much anything that GM made in the last 20 or so years, that was powered by a V8, has some sort of LS in it. Because they are widely available on the second-hand market, it means that they are dirt cheap to acquire. One of the least expensive engines to acquire is the 4.8L variant. From the factory, they ranged from 255-305 horsepower, and despite their small displacement have proven to be capable performers, especially the Gen-IV LY2 and L20 variants, as both had the better-flowing 799/243 heads. Regardless of generation and exact factory configuration, the fact remains that the LS engine is a reliable, robust platform which responds incredibly well to aftermarket modification. To prove that point, Richard Holdener and Comp Cams started with a Gen-III 4.8L LR4 engine from the junkyard and decided to throw some inexpensive parts at it to see what kind of numbers they could put up. Using the stock long-block, intake, but no factory accessories, an electric water pump, and long-tube dyno headers, Holdener made a baseline run to the tune of 335 horswepower at 5,200 rpm and 344 lb-ft of torque at 4,900 rpm. with a little massaging of the FAST XFI ECU system. For upgrades, Holdener kept it simple and affordable, limiting it to just a cam swap and a Zex wet nitrous kit. For the camshaft, Holdener chose a Comp XFI RPM hydraulic roller camshaft (P/N: XR265HR). Labeled as “good torque and very strong mid-range power”, the XR265HR cam profile is designed to operate in the 1,200-6,000 rpm range, with .522 inch of lift on the intake and .529 inch on the exhaust, with 212 degrees of duration at .050 on the intake and 218 degrees on the exhaust side, with a 114-degree lobe separation angle. After installing just the camshaft, Holdener spun the 293 ci mill to 6,500 RPM on the dyno. With just the cam swap, peak power jumped to 382 horsepower and 359 lb-ft of torque. While a 47 horsepower and 15 lb-ft peak gain is impressive, the really impressive part is the huge amount of increase under the curve from about 5,000 rpm onward. 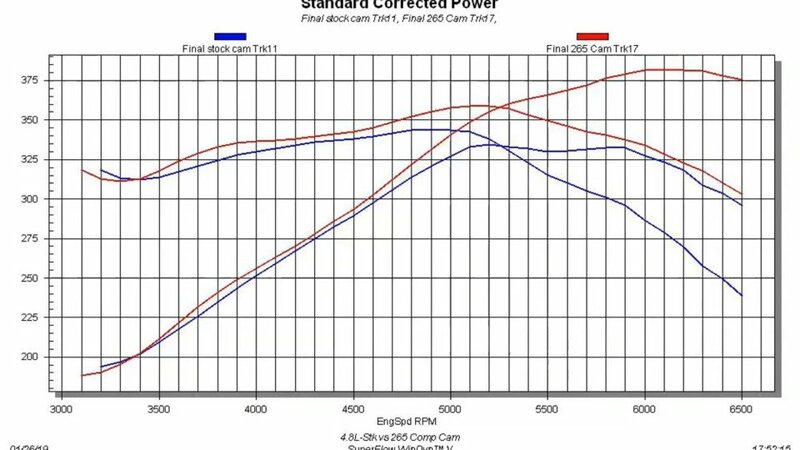 Check out the gains made by the Comp XFI RPM XR265HR camshaft over the stock LR4 camshaft starting at 4,500 rpm. That’s a significant amount of top-end power gained, and would probably lead to quite a bit of ET in the quarter-mile. With that test complete, it was time for the chemical horsepower. 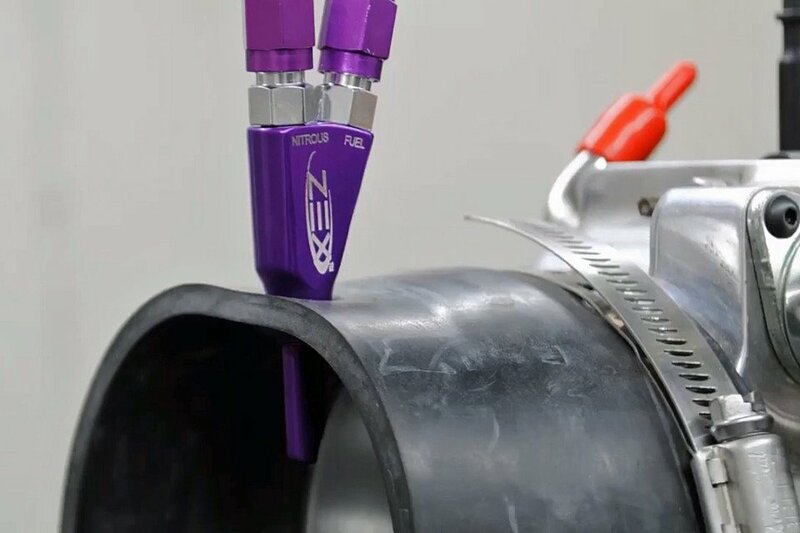 Using a simple Zex single-nozzle wet nitrous system – capable of an advertised 75-125 horsepower gain – plumbed into the rubber hose coupler just before the throttle body, Holdener jetted the nozzle for the 125-horsepower jetting. As you can see, the single Zex nozzle was simply installed in front of the throttle body on the dyno. Installation on a vehicle is just as simple. The jet selection was pretty dead on, because after making a dyno pull with the nitrous activating at 4,800 rpm, there was a near-instant power peak at 5,000 rpm of 501 horsepower and 533 lb-ft of torque – a gain of 119 peak horsepower and 174 lb-ft of peak torque. While those peak numbers are impressive, the fact that the power holds steady between 480 and 501 from 4,900 rpm through 6,500 rpm is even more impressive. At the end of the day you’ve taken an incredibly inexpensive Gen-III 4.8L LR4 engine, and for less than $1,000 at Summit Racing for the Comp camshaft and Zex nitrous kit, you have created an easy 500-horsepower combination that will last far longer than such an inexpensive combination could be expected to. You can definitely tell where the nitrous is activated. Notice the power plateau as everything carries out from activation to redline.